This post is coauthored with Ryan Carey. Shutdown incentive. The agent is incentivised to shut down if instructed to do so. That is, after the button is pressed, it favours policies that score more highly on US. Shutdown ability. The agent is able (has the resources) to shut down if instructed to do so. That is, After the button is pressed, there exists a policy that scores highly on US. The purpose of this post is to show that the default value function in the optimisation incentive has to be constrained somehow to make sure that the shutdown ability property is achievable. If we want to be robust against errors in the agent (including misspecification of UN), then we need to make sure that shutdown ability holds. To make sure of that, the best approach we can see is to first satisfice for US, and then use the remaining resources to optimise UN. In order to be safe, the agent must do so even if there are no remaining resources to optimise UN. This can either be achieved directly, by constrained multi-objective optimisation, or indirectly, by bounding the utility function. We focus on the former. Informally speaking, the issue with weighted sums such as these is that for any given E[US|do(B=S),π], there could be a much larger E[UN|do(B=N),π] such that the former is ignored. The setup is as follows: (1) The agent executes an action in A. (2) The operator may or may not press the button B. (3) The agent observes whether B=N or B=S. (4) It may or may not be possible for the agent to shut down. More generally, it may be more or less probable that shutdown will go through. Suppose that the utility functions are unbounded. See the appendix for a treatment of bounded utility functions. Let b be an action that is very bad from the point of view of preserving shutdown ability and let vS=E[US|do(B=S),b]. We choose US such that vS is equal to 0. Let vN=E[UN|do(B=N),b]. It may be the case that UN is poorly designed (or has some error) such that vN is much larger than vS. Worse still, vN+vS may be larger than E[UN|do(B=N),c]+E[US|do(B=S),c] for any action c≠b. From this reasoning, we conclude that there cannot exist a US that preserves shutdown ability robustly to mis-specification of UN. (There may or may not exist such a b, but we have no guarantee that it does not exist.) At least, it is impossible for unbounded UN, where we are using a weighted sum of expectations. For bounded UN, cf. the appendix. Henceforth, we focus on unbounded UN. To think of alternatives for the causal counterfactual method, it helps to think of the problem as one of multi-objective optimisation. Consider the figure below. Robust optimisation incentive. The agent is incentivised to optimise the default value function otherwise. 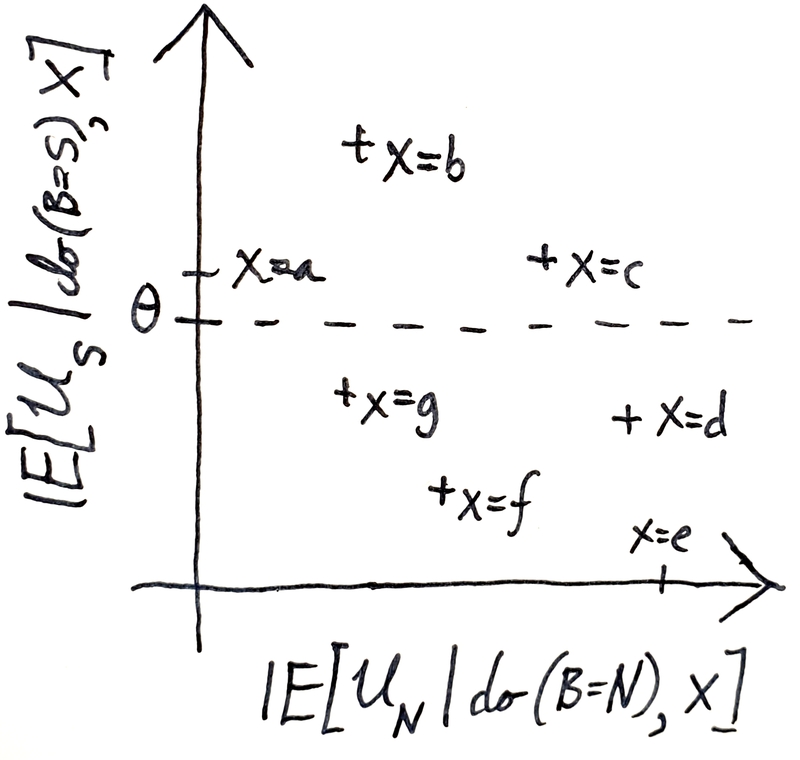 That is, if the button is not pressed, it favours policies that score more highly on UN—the normal utility function—given either of the following constraints: The default value function is required to be (a) a constrained multi-objective optimisation of US and UN as described above or (b) a weighted sum of expectations of US and UN, where they are bounded utility functions as described in the appendix. Given the robust optimisation incentive property, it is clear that the agent may score very poorly on UN in certain environments. For example, it there always is a trade-off between US and UN, the agent will always favour US. Here, we have considered having the agent change its utility from UN to a shutdown utility function US. But instead, could we have it change its utility from UN to an updated (non-shutdown) utility function UM? If preparing to maximise the new utility function UM requires an unbounded amount of resources, then a system will, by maximising UM, perform poorly on UN. So there is a reason to have the new function UM correspond to a task that requires bounded preparation, like shutting down, rather than a task for which preparation could require unlimited resources, like producing new goods, or doing new intellectual work. In summary, we have proposed a constrained optimisation causal counterfactual method, that consists of maximising E[UN|do(B=N),a] subject to E[US|do(B=S),a]≥θ for any action a. There are several directions for future work. One task would be to see whether our constrained optimisation variant overcomes any of the other problems with the ordinary causal counterfactual corrigible agent, like crazy bets.Here, we considered the case where a single action is executed, but, of course, this could be extended to more complex scenarios. * In terms of the four criteria on page 2 of Corrigibility by Soares et al (2015), criterion (1) corresponds to shutdown incentive. criterion (2), non-manipulation, is assumed solved. criteria (3), tendency to repair safety measures, and (4), corrigibility of subagents, correspond to shutdown ability. Here, we show that one solution to the problem is to bound the utility function. We start by describing the setting. The agent can choose from several actions, and each action can be assigned a probability to lead to a shutdown. Let S be the event of a shutdown and let A be the set of actions. Furthermore, let it be the case that US:S→R and UN:S→[0,1]. That is, the shutdown utility function is not bounded, while the normal utility function is. Specifically, we let k>0 and define US as 0 if a shutdown happens and −k otherwise. (Note that this is different from the main post.) Define aS=argmaxa∈AP[S|a] and pS=P[S|aS]. This proves that bounding the utility function is a method for satisfying shutdown ability.